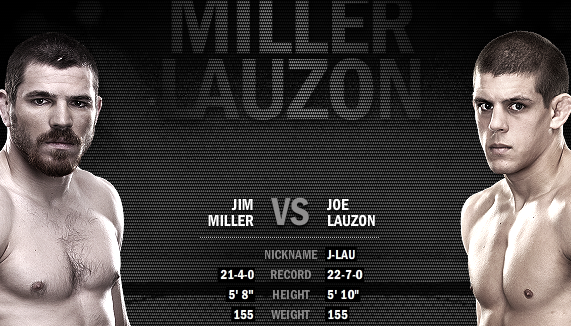 In the semi-main event of UFC 155, two of the UFC’s most prolific Lightweight grapplers will square off as Jim Miller faces Joe Lauzon. These guys have been staples at the top of the UFC Lightweight division for a few years now, and both of them are prolific submission fighters with the ability to end fights from a variety of positions. This is an interesting matchup in that both guys have similar styles and strengths, so something minor could wind up being the determining factor here. Jim Miller, one half of the fighting Miller brothers, is a prolific grappler with decent striking and solid wrestling. While he has dropped two of his last three fights, he has won eight of his last ten against excellent competition, so his spot at the top of the card is well-deserved. One of the things that makes Miller so exciting to watch is that, unlike many grapplers, he has a very aggressive style and is not afraid to push the pace of his fights to set up his submissions. Joe “J-Lau” Lauzon is also an extremely talented submission finisher. He is dangerous from any position on the ground and has decent boxing to go along with his ground game. While he is not as physical as Miller, he is probably a superior grappler from a technical standpoint. The key for Lauzon is going to be getting this fight to the ground in advantageous positions. As good as he is off his back, it’s going to be difficult for him to work underneath a grappler of Miller’s caliber successfully. Basically, this fight is going to come down to which guy can score more points on the feet and which of them ends up in the advantageous position on the ground. In both of those scenarios, I think the edge goes to Jim Miller. He’s a slightly more assertive boxer and definitely a superior wrestler. I think he should earn an edge with his boxing and, when the fight goes to the ground, Miller will be the one controlling pace and position. Miller by unanimous decision. Prediction: Jim Miller by Decision.